Four remaining members of the Japanese Red Army Faction terrorist group living on the outskirts of Pyongyang might not be enjoying as free a lifestyle as recently portrayed. The four are the last members of a group of nine who hijacked JAL351, a Boeing 727, on March 31, 1970, and eventually took the aircraft to Pyongyang. They have been living in the so-called “Japanese village” since then. Earlier in May, Japan’s Kyodo News published photographs of the village taken by journalist Reinin Shiino, who visited the area on the banks of the Taedong river in late April, according to the news agency. One of the photographs shows group member Moriaki Wakabayashi accessing a computer. 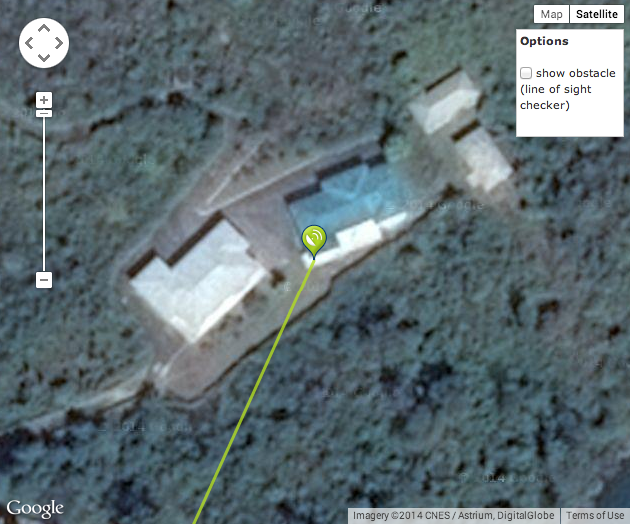 Another image shows three satellite dishes in the garden near one of the houses. 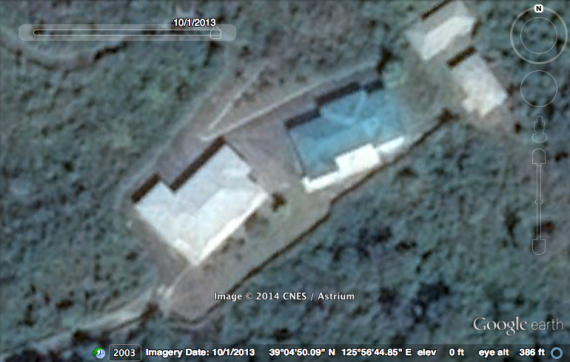 “The four surviving hijackers still live in together, in a three-story apartment building, and are understood to have privileges that are rare in North Korea, including satellite receivers and the use of international telephone lines and e-mail,” Kyodo said. But analysis of satellite pictures of the facility, available through Google Earth, reveal the satellite dishes didn’t exist until at least late 2013 — the most recent date for which imagery is available. In the picture below, the Kyodo image was taken in front of the building on the right, looking towards the south west. Kyodo didn’t say if the system was actually shown working, but the dishes do at least appear to be pointing in roughly the right direction. 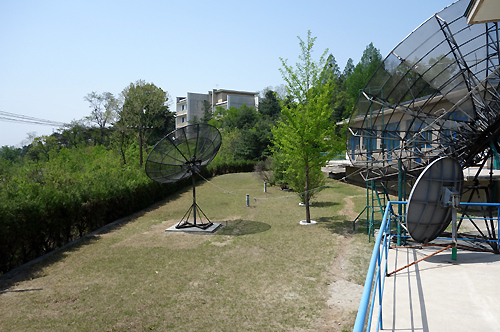 The smaller of the three, the solid white dish sitting closest to the ground, is similar to the type used to receive Japan’s BSAT direct broadcasting satellite, which includes programming from public broadcaster NHK. The two larger dishes are likely for satellites carrying English, Chinese or other Asian programming. But, it’s quite possible — especially given the high prominence in the articles that their communications freedom received — that the dishes were installed specifically for the reporter’s visit. More will be evident when Google next updates its satellite imagery for the area.